Every girl dreams of finding her soulmate and getting married to him in a fairy-tale wedding. However, you need to look the part of the ethereal princess as well. Hair is an essential accessory even on the dullest of all days. With close detail paid to every single detail about the wedding, make sure you do not forget to decide how you want our hair done on the most important occasion of your life. 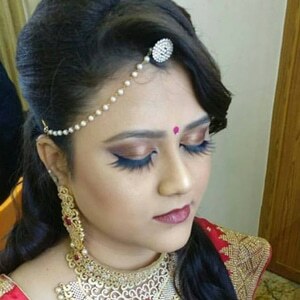 These precious memories will be captured in photograph and videos and will stay with you till the very end, so make sure you get every detail right with tips from top bridal makeup artists in Chennai. Keep your hair well-maintained with plenty of love and care. Regular hair spas can help control the frizz and help your hair become healthier as well. Do not opt for a new haircut a week before the wedding. Sometimes haircuts do not come exactly the way you pictured it. So avoid trying out new haircuts lose to the wedding. You can always experiment once the wedding is over and all the photographs and video shooting sessions are done. Opt for a classic hairdo. Since you will be preserving your wedding memories in the form of photographs and videos, choose a classic and traditional hairstyle that will stand the test of time. You do not want to be the one hanging onto a wedding album filled with big hair photos after twenty years! Professional bridal makeup artists in Chennai recommend getting a blowout on the eve of the wedding to look perfect for the pre wedding festivities. Perfect hair is the perfect accessory for any look. In case you have had bad experiences with hair products or treatments, do mention them to the hair stylist. Better be safe than sorry! Add plenty of protein to your diet to have smooth, glowing hair on your special day. Healthy hair is a feature of a healthy and balanced diet, so make sure you cover all the food groups in the right proportions. Book a trial session ahead of the wedding once you have narrowed down your hairstyle choice for the D-day. This will help you get a visual of how you will look, and whether or not it goes with the whole theme of the day. Trial sessions will also make you feel less stressed on the day of the wedding. Turn into a goddess with your luscious locks of hair in a fancy hairdo on your wedding day. Your partner will have trouble taking his gaze of you, as you cast your radiance over the entire venue. If you have trouble narrowing down your choice to a single hairdo, you can choose one that compliments your outfit for the day. 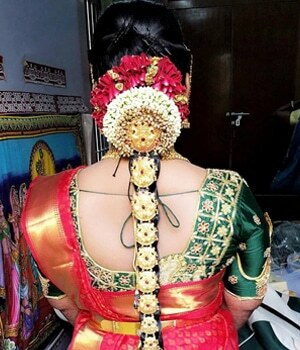 Most bridal hairstyles for reception in Chennai are elaborate affairs and require a lot of time to get them exactly right. Some hairstylists use clip on hair extensions to add volume and length to your hair to enhance the look even more. So get ready to steal the attention as you prepare to say “I do” to the man of your dreams!